Mondayitus isn’t a thing for me – I work Mondays but because I work late Sunday and Mondays, I enjoy a breezy sleep in while everyone makes haste from their perches to the cold topside of a sterile desk. This allows for not only a lovely sleep-in and a natural coming-to-conciousness but a lazy dillydaddle in the kitchen before my week starts. Like so many, I’m always on a diet – this isn’t a New Years Resolution but more of a “New Year Adapt or Die”. Sounds a tad serious? It is and it’s not. It starts basically with diet and expands from there but let’s start with the basics. Dieting includes not just a simple no-carbs, no-sugar regimen but a change in attitude. Yes, there are strict rules with which I break on occasion because breaking up with croissants would give me lethal withdrawal but it’s also about not punishing yourself. I try to look at it as an exploration of alternatives much like one considers the other possibilities to fossil fuels. Think of it as the same way as a whitey being plopped down in Asia and trawling the night markets. There’s a plethora out there of things to try other than steak and chips to whet one’s appetite. A few things to clarify before I begin – I work sporadically and late, I don’t make much money although we’re not talking minimum wage here and I live in Australia where I’d say generally produce is easy to procure cheaply and abundantly. I’m not the most active person, in fact one might compare me to a sedentary worm who enjoys nestling in warmth and not moving much. I’m loveable like that. I find most exercise monotonous and boring but fear not, I’ve worked around it. Or at least our relationship is a work in progress. Just minus bread from all the things you usually have bread with. Yes, I’ve started eating vegemite and peanut butter right from the knife. Today’s a great example: I would normally include a piece of rye/multigrain bread underneath this but I didn’t. The difference? Honestly not much. If I do indulge in a burger (after drinking, this happens without my conscious knowledge), it can be pretty unavoidable. In fact, whatever you’re consuming is badly unavoidable but I usually just trying to help things by detracting one of the buns, utilising the ‘patty’ as the topside. You’d be surprised how many carbs, sugars and calories you’ll lose by losing one. There are pasta alternatives like konjac pasta (Slendier is the brand in Aus) – it doesn’t taste like pasta but whenever I have a serious craving I whip it out. You can buy it at the supermarket. Another alternative is peeling zucchini or squash into spaghetti strips! For the most part however, I minus it like the bread. With the sauce, I’ll put it over meat or fish instead or make meatballs. Mum actually made this really beautiful fennel lamb meatballs and sauce because I told her I couldn’t eat the pasta. She still made the pasta and I had to hide it before I snuck some. There are also lots of great creative recipes that get around the ‘pasta problem’ like this keto recipe for gnocchi that is only made out of cheese and egg! Increase your vegetable intake not because the doctor told you to but because vegetables can supplement EVERYTHING and goddamn, do they make me feel better about myself. I love cheesy rice – love it. I used to buy it in the packets and eat it with everything plus more cheese. Not the healthiest…tsk, tsk. For our Christmas party, one of my mates made Cheesy Cauliflower Bake and since then I’ve made it a weekly thing. It’s delicious, filling and so so so healthy. Obviously, don’t overdo it with the cheese even if you are doing keto but steamed soft cauliflower dripping in slightly melted cheese sauce is such a wonderful thing to come home to. Salt and pepper it well and throw in some cinammon. Like cauliflower as well, pumpkin is super useful. Pies are a big thing in Australian culture and while dieting, it’s hard to overlook sausage rolls and my personal favourite, Shepherd’s Pie. I really love Sheppies – in England, I had it every time we went to the pub. It’s not actually too difficult to make it healthy – buy lean mince (which will be more expensive but you don’t need a lot to last one person three days), fill it with lots of other vegetables (onion, mushroom, celery, carrots), emit the crust and instead of potato – use pumpkin mash which is even better than sweet potato which is the usual alternative. I mash it with butter, almond milk, salt & pepper and lots and lots of cinnamon. Other fantastic vegetables: eggplant for eggplant chips, celery with humus is a great all the time snack, Costco sells THE YUMMIEST and also HEALTHIEST salad in all the world – kale and edamame with coriander sauce. I can honestly say I almost ate the entire box when I first got it and felt no regrets. Seaweed salad which costs a few bucks from any sushi place is also a great snack. If you’re really lazy like me, just chop up a bunch of vegies (eggplant, capsicum, parsnip) and roast them or steam some frozen peas and eat it with whatever your main is. Avoid dat carb side. I should mention possibly my favourite super healthy side to any meat or fish dish is mango salsa which is simply diced tomato, diced cucumber and diced mango with a bit of balsamic and I just layer that over grilled fish or chicken. As much as you want. I try to eat as much fish as possible. I’m not allergic and I love it thanks to my mother rearing me on fresh-chopped-out-the-back-garden crab. Score. I’ll eat anchovies, crab, salmon, cod, prawns, mussels and anything. My personal favourite is oysters but they have to be super fresh down at the wharves or I’ll cry. It’s super easy and lazy to cook it too – my supermarket does this great thing where they’ll mix you up an oven bag of fish with a sauce and you just pop it in the oven for 20 minutes and presto – DINNER. Chicken and seafood are still the best by far and let’s not forget to add tuna to that. Meat or seafood basically serves as my “main” and I try to base whatever I want around that whether it’s as simple as a sauce or more complex like a mash or soup. I stopped drinking milk a really long time ago and now drink purely almond or soy. They even do a great long-life mixes of coconut and almond milk now. Weightwatcher’s has the tastiest, I kid you not, ricotta cheese on this planet at almost zero calories per serving. I was absolutely unbelieving when I bought it and then I tasted it and besides sometimes shilling out for real buffalo mozarella (swoon!) or goats cheese (love!) – I love throwing it in any and all salads. Ditto for soy cream cheese – it won’t ever be as rich as Philadelphia’s but it’s definitely just as tasty and much much healthier. Only problem is I have no idea what to put it on if it’s not dolloped on a freshly made sesame bagel. Explore your cheeses – this isn’t the healthiest tactic but using cheeses slices or shredded cheeses isn’t your only option. Most delis will have a variety to choose from like gruyere, burrata, goat, camembert etc and even cheeses mixed with fruit. Cheese doesn’t have to go with crackers too. For example I love the tiniest piece of blue cheese on a bit of apple. Downside: I literally eat blue cheese on my own because no one else can stand the smell. Saddening. When I do eat eggs because who doesn’t love eggs – I again nix the bread and eat it with avocado. Healthy fats. 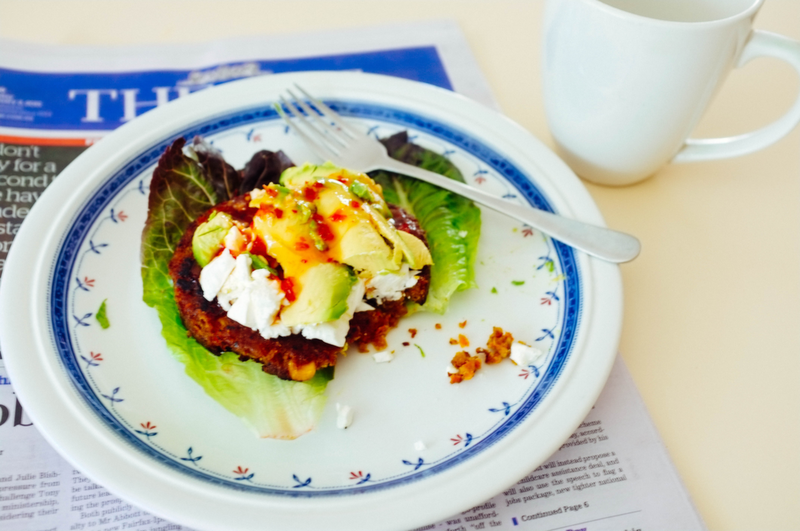 Trying to work myself up to just eating the white – it just seems like such a waste to throw away the yolk! I used to drink so much juice and spend a quality $15 a week on it if not more – Nudie Juice has the best, let’s be honest at $6 for a 2l bottle. But I don’t do that anymore. Juice has the highest sugar values, even the really good ones, so it’s probably not good to drink them even if you have met your target weight. That said, I will enjoy a good one – filtered – when I’m in need of a good morning cure. Hydrate me my dearest orangina! Basically, I drink water and black coffee and that’s it. Okay, fine, I indulge in chai lattes but no sugar unless forced to – they are ALWAYS better with honey. Black coffee is something to get used to but after a while, you’ll realise how sweet sugar makes everything. 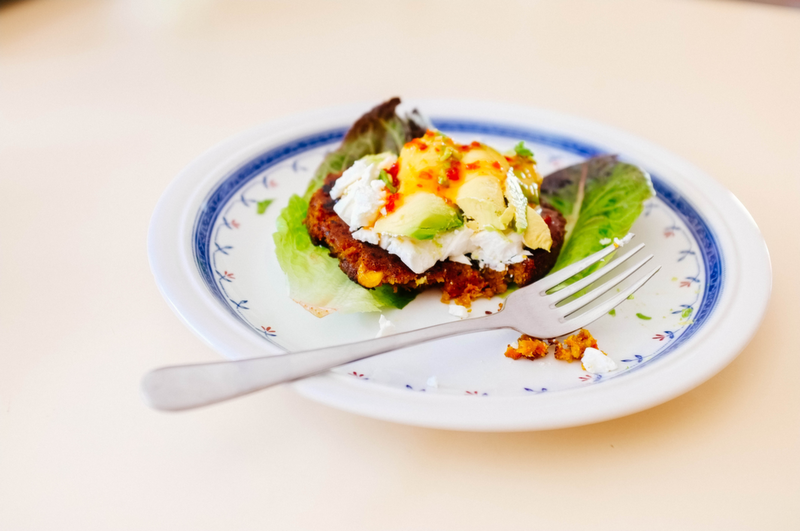 Today’s lunch was a Moroccan vegetarian pattie made out of lentils and spices, no bread with lettuce, fetta and avocado with a little sweet chilli sauce on top. I’m stuffed – especially because I managed to down two glasses of water in between bites. That’s also a massive tip – don’t just eat and THEN drink. Eat, chat, drink, rinse wash repeat. Do that and you’ll slow your intake especially when you’re out for dinner/lunch as well as fill up much faster. I’m finding that I’m filling up by the time I get halfway through a meal. Even faster, if I’m drinking black coffee. In my mind, I guess I’m not after strictly losing weight (haven’t even checked the scale) but I feel a lot healthier, have a lot more energy and I haven’t felt bloated and sluggish in yonks. It actually DOES work and if you don’t believe, try it for a week and then just CHEAT for one day – indulge in that over-processed burger you’ve been craving all week. I did that two days ago and man, if I am not still paying for it… Don’t tell me you don’t immediately slug-a-worm it like me and slip into a carb overload sleep where I wake up with a distended tummy and one-night-stand regret. 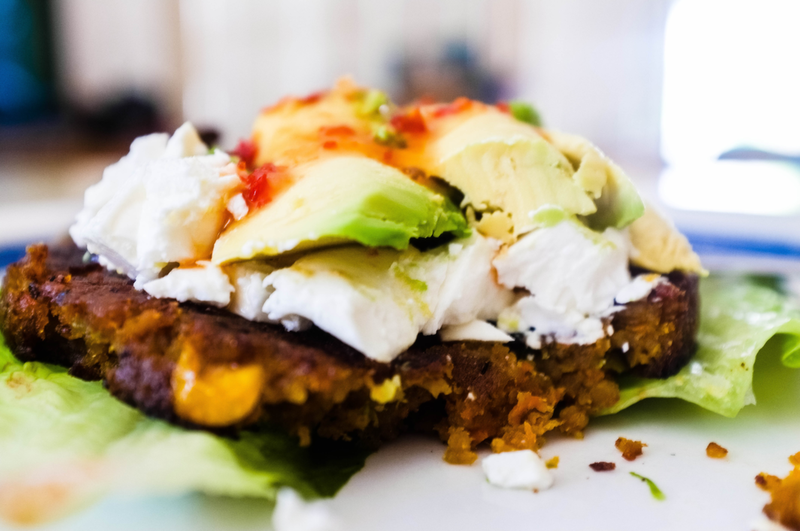 There’s also a feeling of accomplishment – I feel creative having just made that up even though it’s simply a variation of a vegetable pancake topped with condiments. But there it is! I like creative solving and enjoy finding a recipe (the gnocchi one) that I can’t wait to try and make variations of. Plus, the one thing I knew couldn’t really take hold of was restraining the eating itself. I love to eat and I can only, nowadays, restrain only so much. Your body is not MEANT to starve itself and there’s a reason why food, even in emotional eating stages, brings us so much happiness and joy. Last night I got home late from work and hunkered down to do some writing – I was exhausted and starving…so scoffed an entire pot of cut up melon and celery with humus. It wasn’t as if I’d made myself eat an entire bowl of cabbage soup – it was delicious and I was grateful I hadn’t reached for the over-salty popcorn bag. Finding a partner doesn’t have to be one or the other – great looks or great personality – the same goes for food. Like that little girl from the Mexican food commercials – why not both?